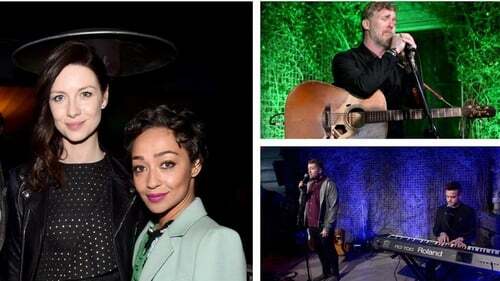 Ruth Negga, Caitriona Balfe, Glen Hansard and Irish singing duo Glenn & Ronan were among the guests on the green carpet at the US-Ireland Alliance's Oscar Wilde Awards in California on Thursday night. The ceremony, which took place at JJ Abrams' Bad Robot production company in Santa Monica, is held each year to mark the contribution of Irish and Irish-Americans to the entertainment industry. Irish-Ethiopian actress Ruth Negga was honoured at the event for her role in Loving, just three days before she will compete for the Best Actress accolade in the upcoming Oscars on Sunday, February 26. The film tells the true story of Mildred and Richard Loving, the interracial couple behind the pivotal 1967 civil rights case Loving v Virginia. On stage, the 35-year-old star said: "I'm very touched by how many people it's inspired. "I hope people search out this couple and find out more about them." President and founder of the US-Ireland Alliance Trina Vargo said “We’re thrilled to honour Ruth. “I watched the film several times at our various screenings and found new subtleties with each viewing. Dublin-born, Monaghan-raised actress Caitriona Balfe also received an award at the 12th annual ceremony. "It's been a great year for Irish actresses, and we're delighted to honour one who is receiving well-deserved recognition for her success in Outlander," Vargo said. "Given Caitriona's intense schedule of time travel and the cold and rainy Scottish weather, our event should be relaxing for her. The one thing that Outlander and the Oscar Wilde Awards have in common is whiskey." Irish singing duo Glenn & Ronan, who went viral with their Adele medley last year, opened the prestigious event for Oscar-winning musician Glen Hansard, who was also honoured with an award on the night. Irish-American actor Zachary Quinto, who is openly gay, urged the public to "fight for people who are striving to find their way in this world" and criticised President Donald Trump's decision to rescind public-school bathroom rules for transgender students. Accepting his Oscar Wilde award, the Star Trek star said as "an openly gay man in Hollywood" he had been inspired by Wilde's "inability to back down". "I feel like as far as we've come in the last 120 years, there are protests going on tonight about the reversal of protections for transgender children in this country," he said. I believe it is all of our responsibilities to stand up and be authentic and be visible and fight for people who are striving to find their way in this world, even if it is not reflected back in the same way as everybody else. "Oscar Wilde is someone who taught me that before I even knew it," Quinto added. From Pennsylvania, Quinto's mother's family are Irish and he spent five months in Ireland while in college, working in the Javas coffee shop in Galway. On stage, Star Wars: The Force Awakens director Abrams paid tribute to late actress Carrie Fisher, who received an Oscar Wilde Award in 2015. "2016 was a weird one," he said. "It must be mentioned that in addition to other various tragedies over the last 12 months, we lost a dear friend and former Oscar Wilde honouree Carrie Fisher. As Stephen Fry said here two years ago when we honoured Carrie, she had a genius for life and friendship. I can attest to that fact and we'll miss her dearly." Last night actor Martin Shortt - whose father was born in Crosmaglen - was also honoured for his contribution to the industry. Previous Oscar Wilde Award recipients of awards include actors Brendan Gleeson, Daisy Ridley and Saoirse Ronan, talk show host James Corden, singer-songwriter Van Morrison and directors Neil Jordan and Jim Sheridan. The Oscars will take place on Sunday, February 26. RTÉ Entertainment will have coverage throughout the night on Sunday and you can catch the TV highlights on RTÉ2 at 9:30 pm on Monday.